Cat's Claw, or Uña de Gato, is an herb that has been valued for centuries in the Amazon. As an excellent natural antioxidant for the body, Cat's Claw helps promote healthy immune function and joint health. ** Our preservative-free gelatin capsules contain pure milled herb powder. You can even open these capsules and prepare Cat’s Claw as a tea. At Vitamin World, we use only the finest quality herbs and spices. Each is screened and finely milled for quick release. 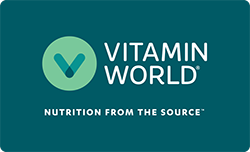 ◊Vitamin World’s Natural Whole Herb products utilize ground plant parts to provide the natural components in the amounts found in nature. DIRECTIONS: For adults, take one (1) capsule three times daily on an empty stomach. Capsules may be opened and prepared as a tea. Other Ingredients: Gelatin, Acacia Gum, Vegetable Magnesium Stearate. Cat's Claw 500 mg is rated 4.2 out of 5 by 5. Rated 5 out of 5 by Kim1 from Awesome Product!! I am a health enthusiast that enjoys staying active in the outdoors. This product give me the additional support I need to get through a grueling workout. I now make sure I always have this product. Rated 5 out of 5 by triunfadora123 from EXCELLENT. THE BEST. Excellent Product. I could say so many good things about this product, but guidelines are forbidden for. I have used this product for about 17 years and has missed no opportunity to get the positive expected results. Very very grateful to GOD and this product. Better than this natural product I can't name other. Just do the research on internet about this product qualities and find out for yourself. No flaw. Rated 5 out of 5 by PattyK from Great product, great price Was so excited to find Cat's Claw in the catalog. Have purchased it at my local health food store for years and it can be quite pricey. Thrilled to find it online and the fantastic and quick shipping make it a real deal!